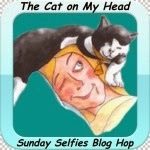 We have LOTS of Selfies in this video today...and we are joining the Sunday Selfies Blog Hop over at Cat on My Head! What a truly delightful montage for the selfies, and always a delight to see your beautiful white fluffy fur and smiling faces. AWESOME video clip of both the photographs and music! That's one of my favorite Elton John songs! Now THAT is a beautiful selfie video!!! What a great compilation of selfies! Oh, that is so cool!!! And you knows that Ma is NEVER gonna gets that song outta her head, rights???!!!! BOL! I hopes you all have a most FABulous and Happy Easter! !